Microwave Browning Plate with cover. Would you like contacting if or when microwave-browning-plate-with-cover becomes available again?" Now microwaves can brown, crisp and fry food using the Microwave Browning Plate with cover. Place without preheating with food in the microwave. 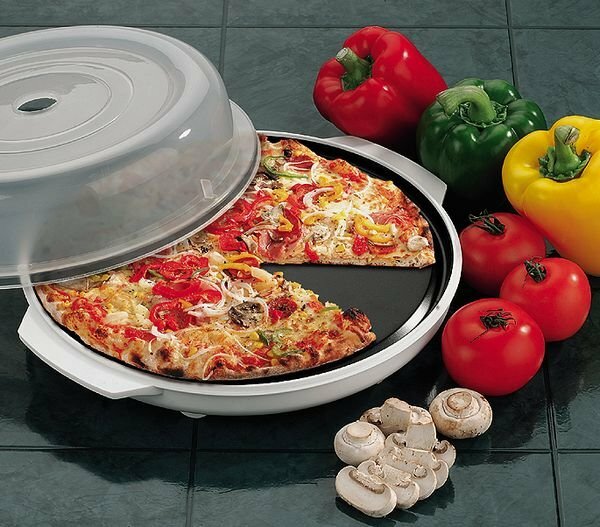 The specially designed material super heats allowing you to cook in ways thought impossible in microwaves before. Steaks sizzle, sausages and bacon crisp, french fries fry, frozen pizza comes up a treat, eggs crackle and steaks sear, and the humble sandwich is made proud. At 10 in you could do a whole main course meal, instructions give you a breakfast and steak dinner. And as the surface is non stick fat is optional. Comes with insulated base so you can go direct to table, and a cover to stop splattering. Get a Microwave Browning Plate with cover and transform your microwave oven. Microwave Browning Plate with cover text, images and video are copyright.